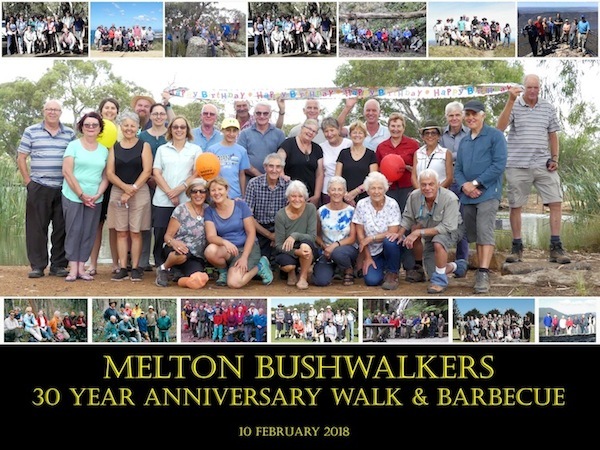 Welcome to the Melton Bushwalkers Website. You are probably looking up this site because you want to meet new people, take up a physical activity for your health and explore the great outdoors at the same time. You have come to the right place. Our members are friendly and outgoing, and love to share what Victoria has to offer. We generally walk every two weeks, either Saturday or Sunday. However, we may have a few extra walks depending on walk leader availability. Walks vary from easy to hard to suit people of different capabilities. TRANSPORT to walks is by member's own cars and we also car-pool and share fuel costs. The usual arrangement is for the driver to work out the amount, which is shared equally by the driver and passengers. ASSEMBLY. If a walk in our Activites Program shows departure from Melton, assembly is in the shopping centre car park on the corner of High Street and Station Road. "Foodworks" supermarket sign is prominent. Aldis supermarket is on the opposite side of the road. On the other corners are Shell and BP. Assemble from 7.45 am and depart at 8.00 am. Our group is easy to spot, the car park is almost empty at that time. Cars left at the car park, are left at owner's risk. If you have not walked with us previously, please refer to "Join us" page. Melton Bushwalkers has a Facebook site, where you can view recent photos and reviews about our walks. Click on the Facebook symbol at the top right of this page to go to our Facebook site. To download and view our Activities Program click on the attachment below. The program is in pdf format.